I recently returned from an amazing, whirlwind family vacation. I looked at my email once or twice the morning we left, and then didn’t open it again until I returned to the office. It was glorious. This doesn’t just happen after vacation. Maybe it’s a week with endless meetings, extra time focused on a project, too much time on Facebook, or any other reason our email inboxes get out of control. Regardless of the reason, 400 or 10,000 unread emails in your inbox is stressful. 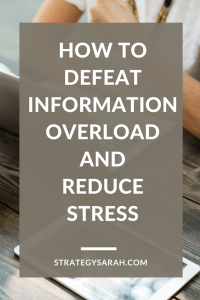 Figuring out how to catch up on email while you’re also catching up on actual work can be challenging. I once worked with a guy who, when he returned from vacation, would delete all emails and voicemails without looking at them. That’s certainly one way to catch up on email! The first time I witnessed this behavior, I was in awe. I’ve since heard it described as “declaring email bankruptcy,” or wiping the slate clean and starting over. Email bankruptcy: When your email inbox is so overloaded that you delete everything and start over from scratch. I don’t know about you, but there is no way I could ever have the nerve to do that. In this particular co-worker’s case, a large percentage of his work was time-sensitive, meaning that 75% of his messages probably were irrelevant after any length of time. The remaining 25% would haunt me. What was there? What if it was important? His theory was that if it was truly important, the person would ask again. Considering that I never heard anyone comment about his work going unfinished, he must have been right. 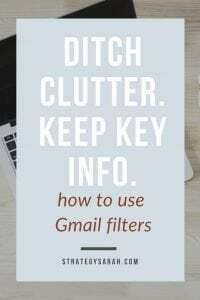 This “safer” alternative to declaring email bankruptcy removes all emails from your inbox, unclutters your daily workspace, and gives you the mental space needed to start fresh. Bonus: If you truly need a piece of information from one of those emails, it’s there. And unlike shoving stuff in a physical closet, most email accounts have enough space that this has no effect on storing or retrieving any other emails. Practically speaking, Gmail makes this incredibly simple with the “archive” button. 2. Then hit the “Archive” button. 3. Gmail pops up a notification that “All 50 conversations on this page are selected. Select all 402 conversations in Inbox” (Obviously, this is my example, and 402 would show the total number of conversations you have in your inbox). 4. Choose to Select All and hit the Archive button. 5. If you really want to take a quick scan, you can archive by page with 50 at a time. 3. 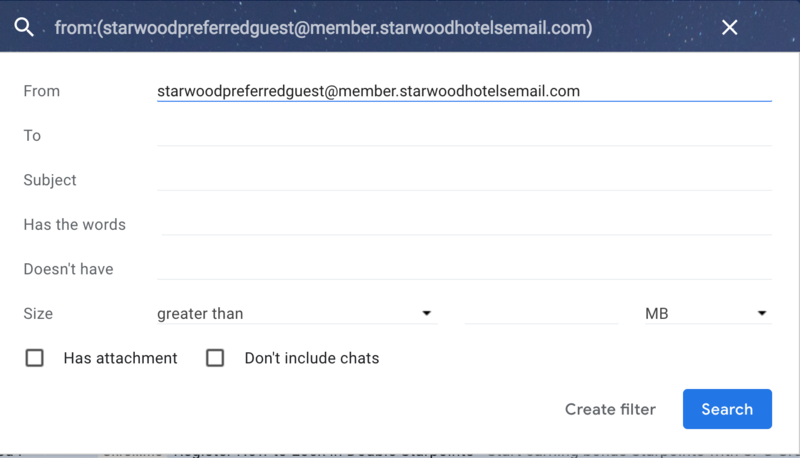 Select all the emails in your inbox (CTRL + A on a PC, or Command + A on a Mac). 4. 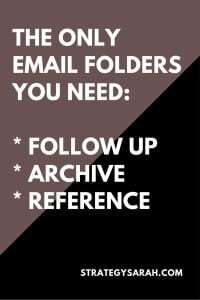 With all emails selected, simply drag and drop over to the newly created Archive folder. 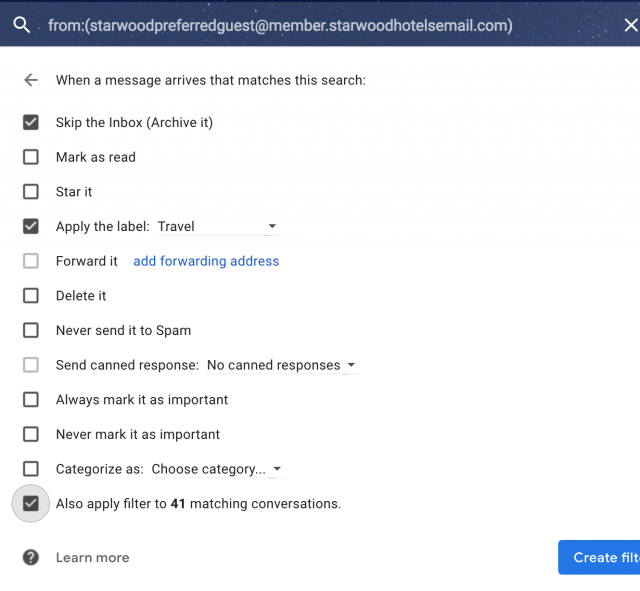 Need a simplified day-to-day email management strategy along with a vacation strategy? 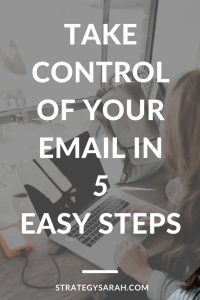 Check out this super simple email organization methodology. In any given work day, I receive 100-200 emails. Definitely not Inbox Zero. Some of you may be thinking that’s an insanely low number and some of you are probably overwhelmed by how high that number is. During a busy workday, it’s not uncommon to have 20-30 emails come in while I’m in a single meeting. 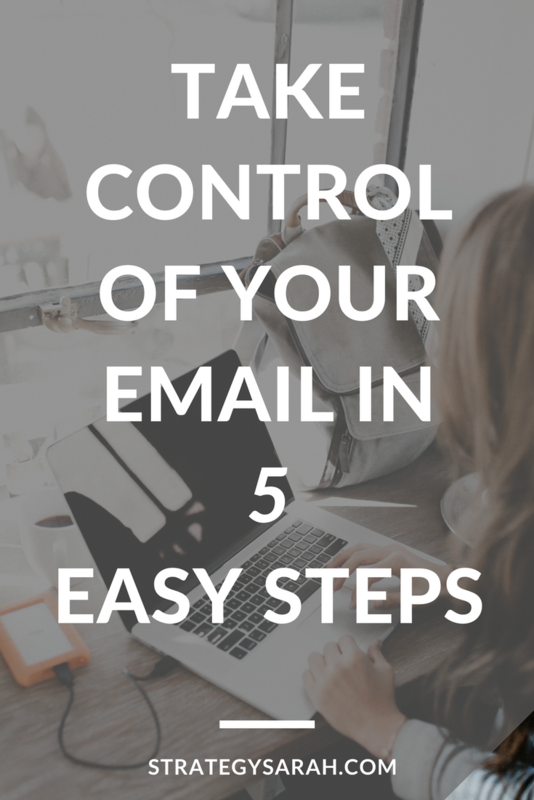 This means that a clear email management process is critical. 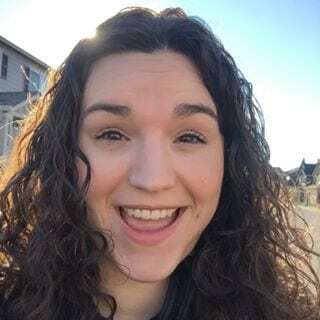 If Inbox Zero isn’t the goal, what is? Many people strive for Inbox Zero, which I found frustratingly elusive and quickly decided was not my goal. I think I’ve actually achieved Inbox Zero in a professional email inbox approximately twice in my entire career. I only keep emails in my inbox that I need to take action on. My goal is to keep this under 10-15 emails, and I get very twitchy if it gets more than 50-60. My goal is to end the day with fewer than 5 items that need action in my inbox, but it’s currently more common that I’m hovering in the 15-25 item range. A few years ago this would have appalled me, but in my current season it feels doable. As I mentioned, this only contains emails that I need to take action on. This includes unread emails (because at a minimum, I either need to read and delete them or just delete them) and any email that requires any type of action on my part. For my corporate email, I also keep all emails directed to my inbox and scan/read and file accordingly. I have found that automatically filtering email tends to lead to an out-of-sight, out-of-mind mentality, and these emails get ignored. If you’re considering automatically filing an email, ask yourself if you really need to be receiving it in the first place. 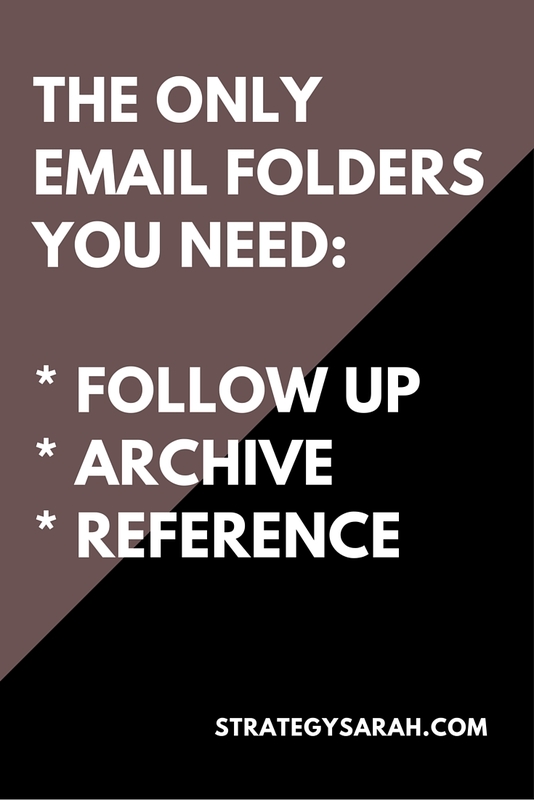 The general archive doesn’t need a folder in Gmail, as it’s a built-in archive function that’s immediately searchable. In Outlooks, this is a manually created folder that emails get saved to (with the lovely drag-and-drop functionality). Just what it says it is, reference documents. (Although, if I were following my own process, there shouldn’t be any reference documents living in email, as they should all be saved in either Evernote or Dropbox. I’m still a work in progress). That’s great, you say. But how do I get my insane volume of emails processed and filed appropriately? I’m so glad you asked. The current volume of my incoming means that at the end of the day, I can still have 60-80 emails that need action on my part, even if that action is only filing. I try to take 15-30 minutes at the end (or beginning) of each day to review emails, take action on those that only need quick action and block time for those that need a longer response. This allows me to better focus on the task at hand knowing that a) there isn’t anything that needs my attention this.very.second and b) that I have time planned to appropriately respond to the messages that are there. 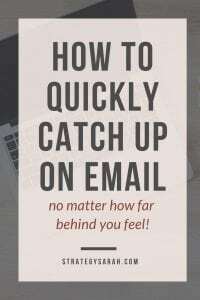 David Allen’s Getting Things Done method encourages responding immediately to any message that will take two minutes or less to answer, which is a great goal, but sometimes I have 50 messages and 5 minutes to review all so it’s not realistic to answer even the short emails in that time frame. Email triage is a great thing, even though you definitely need the longer follow up sessions. Email triage on your smartphone is a brilliant way to use minutes waiting in line or for a meeting to start. Confession: I do have a love/hate relationship with email on my phone. Smartphone email makes it super easy to do the scan version of email triage, but it also makes it deceptive just how many messages you have when you see the 10 unread messages on your phone and then get to your desk and realize there are 85 messages in your inbox, you’ve just technically “read” most of them when you were scanning for urgent needs. I still think the benefits outweigh the negatives – as long as you follow up on your primary computer. With that, I need to go finish digging out of today’s inbox…what email management strategies work well for you?